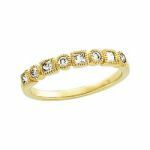 A 5.0mm wide band that has alternating diamond & flower shapes in a continuous pattern with a rhodium plated finish. Size 8. 8mm 2.0 carat cubic zirconia engagement ring with a wide band and channel set accents on the shoulders. Size 5 & 6. 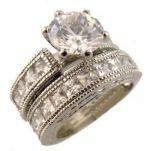 8mm sized cubic zirconia engagement ring with channel set princess cut cubic zirconia on the shoulders and wedding band.Both pieces have a vintage embossed pattern with milgrain edging. Sizes 5, 6, 7 & 8. A 7.0mm 1.25ct champagne colored cubic zirconia ring accented by a halo of pave set cubic zirconia surrounding the center and pave' accents on top half of shank. Size 5. 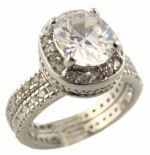 10x8mm oval cubic zirconia engagement ring accented by a halo of pave set cubic zirconia surrounding the center and pave' accents around the shank. Matching eternity wedding band included. Size 9. 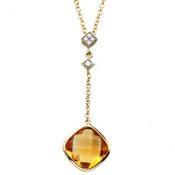 Radiant cut 4.00 carat citrine colored cubic zirconia ring accented by pave set cubic zirconia framing the center stone and on the top half of shank. Size 7. A 8.0mm 2.00ct pink colored cubic zirconia ring accented by a rose tone halo of pave set cubic zirconia surrounding the center with trillion accents. Size 8. Manufactured per order using original hand carved dies from the 1800's. 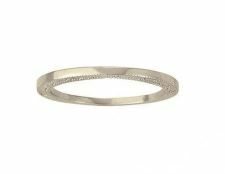 This particular bangle was accented with 8) .04 carat diamonds. A 6.5mm semi mount engagement ring for a 1.00 carat round diamond (center stone not included) with .15cttw diamond accents. 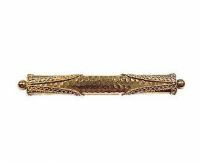 The band has an embossed wheat pattern with scrolls on the shoulders. White & rose gold or white & yellow gold. A 6.5mm semi mount engagement ring for a 1.00 carat round diamond (center stone not included) with .13cttw diamond accents. The band and sides have a hand engraved scroll pattern. Matching wedding band available. Antique style 2.5mm wide curved band accented with .11cttw of diamonds, a hand engraved scroll pattern and millgrain detailing. 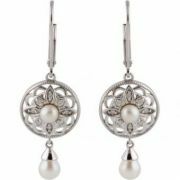 Vintage style circular shaped filigree 4.0mm cultured pearl, .08 cttw diamond and tear drop shaped pearl dangle earrings. 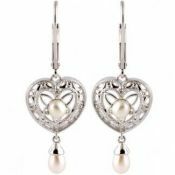 Vintage style heart shaped filigree with a 4.0mm cultured pearl, .04 cttw diamond and tear drop shaped pearl dangle earrings. Matching pendant available. 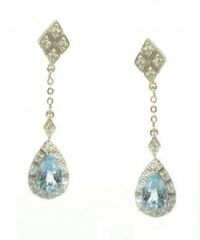 Art Deco style .16cttw diamond with 6x4mm pear shaped aquamarine drop earrings. .20cttw Art Deco style diamond and 7mm freshwater pearl drop earrings. 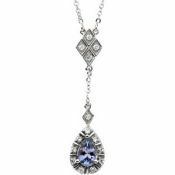 Art Deco style .16cttw diamond with 6x4mm pear shaped tanzanite drop necklace. 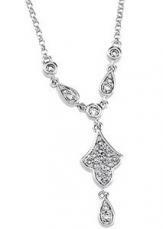 Featuring a 1.7mm .02 carat diamond accent set in a filigree dome. Perfect ring for children and young adults. 2.5mm wide wedding band with an embossed vintage floral design. 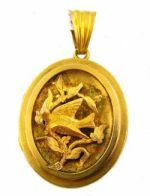 Manufactured from a mold of the original antique hand carved die. Set with 2) 5.0mm opals with a rhodolite garnet. Setting is made from the original mold circa. early 1900's. Set with a .27 carat old European cut diamond, VS clarity and H in color. Setting is made from the original mold circa. early 1900's. Set with a .29 carat old European cut diamond, VS clarity and G in color. Setting is made from the original mold circa. early 1900's. 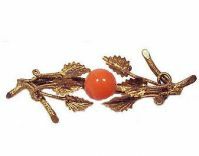 14k yellow gold red garnet and glass doublet surrounded by approx. .33cttw rose cut diamond accents. Suitable to be used as an engagement ring. Set with a .36 carat old European cut diamond, VS-1 clarity and G in color. Setting is made from the original mold circa. early 1900's. 7.0mm 1.75 carat round checkerboard cut rhodolite garnet. Setting is made from the original mold circa. early 1900's. 5.5mm Mozambique garnet. Setting is made from the original mold circa. early 1900's. 9x8mm fancy shaped amethyst framed in white gold with a yellow gold bezel & setting. Circa early 1900's. 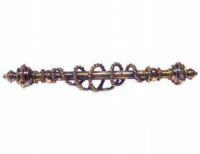 A Victorian garnet doublet as imitation sapphires accented by approx. 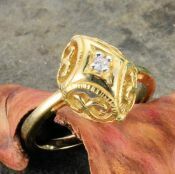 .10cttw rose cut diamonds in a bi-pass designed ring. Circa 1890's. 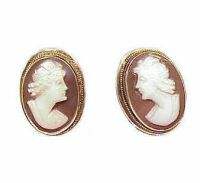 Having a 14x11mm hand carved cameo on carnelian & white colored shell in a bezel setting. Fits a 2.2mm to 2.4mm gemstone or .03 to .04 carat diamond. 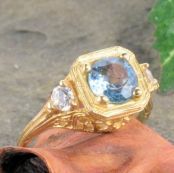 Sold by the pair as settings only, gemstones are optional. 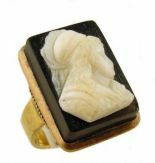 15.5 x 11 mm cameo carved from (banded agate) black and white onyx depicting a what appears to be a Grecian male or soldier.